(NOTE: Fair Copy text is always entered on recto pages except for 46v). Mary Wordsworth enters most of the first block of work from the missing MS and from MS A in a fair copy hand from 1r-21r. Within this copy though, William and Dorothy briefly take over at certain points. Mary then copies the base text again towards the end of the notebook on 45r, 46v-47r, as well as copying out the "Prospectus" with the fair copy text ending on 47r. Mary enters later MS D revisions on the verso of pages 12, 18, 26, 32, 34 (one line only), 39, 43 (two words only), 45. Dorothy has two small blocks of copying within Mary's fair copy at the top of 13r and at 18r-19r. She finishes copying MS R from William at 28r-29r. She copies the section from 35r-36r. William enters text on 5r-8r (within Mary's fair copy) (as well as making on-the- page corrections at various points); he begins the copy from MS R after Mary's MS A entry and this runs from 22r-27v and is then completed by Dorothy. He starts again at the second sewn-in gathering from MS R and enters copy from 30r-34r and 36r-45r. At the back of the notebook William copies the text on 46r with earlier draft entries by him on 47v-48v. William enters draft at the end of the notebook (47v-48v), prior to completing the fair copy of MS B. These correspond to lines 936-958 entered on 43r and 44r. William makes additions on the verso and crossings-out on the recto pages between 21v and 27r. 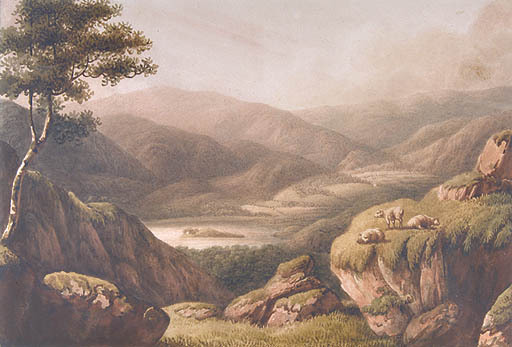 All of this work is concerned with removing the Grasmere narratives from Home at Grasmere and placing them in Book VI of The Excursion. William re-drafts on versos opposite the fair copy text preparatory to a possible re-writing of MS B once Excursion material was removed and makes crossings out in the base text. These changes centre around the missing page 9 and are also concerned with the "happy Band" passage which Wordsworth was possibly thinking of removing. See pages 1r-2v, 3r-4v, 7v-8v, 14v, 20v, 27v, 31v-37v, 42v, 45v, 48v. MS D revision on verso pages (brackets indicate MW hand): , , , 30, , , 39, 43, 45. Some of this revision may also have taken place in 1812-14.